Lucas Simões’s Abismo sculptures, whether freestanding or hanging on the wall, combine geometric shapes cast in concrete, stacks of tracing paper, and sometimes thin sheets of wood, copper, or brass. 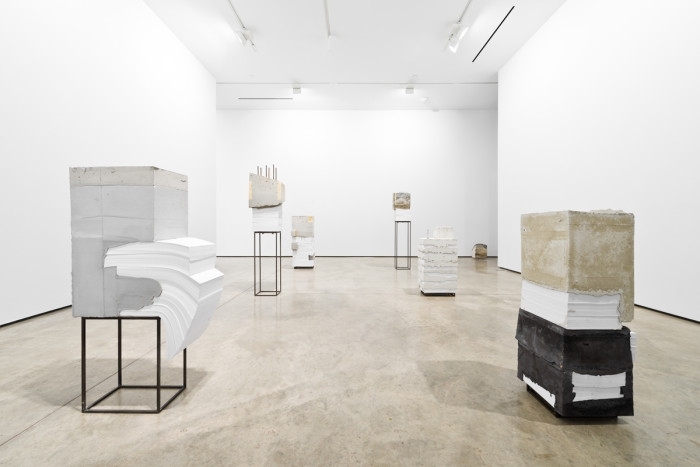 Simões precisely aligns hundreds of sheets of paper and pinches them between or drapes them over concrete forms without internal supports or glue —only gravity holds the sculptures together. The severe concrete elements are inspired by Brutalist architecture and contrast sharply with the gossamer-thin paper that flutters in circulating air. 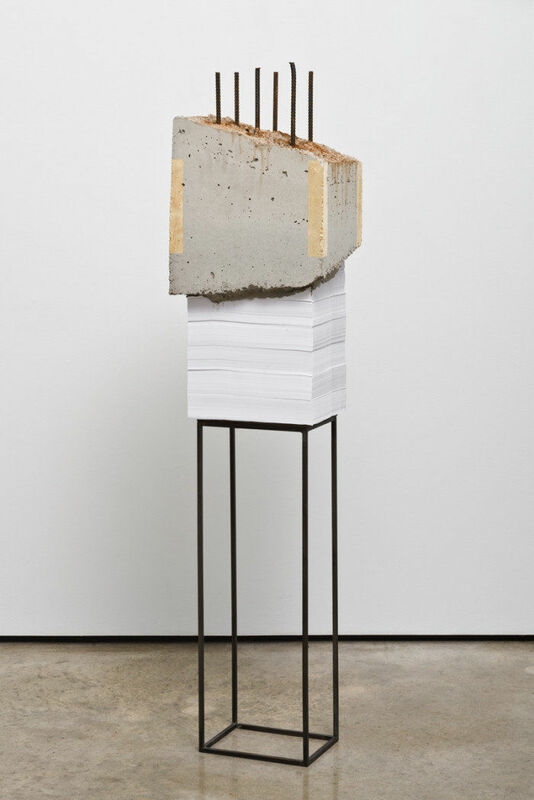 Simões is also presenting a new series of six column-like works made from concrete and copy paper. The six pieces are arranged in a grid, as if they were pylons for an imaginary building in the process of being built or demolished. Paper and concrete seem to cascade toward the ground or climb skyward in a regular pattern, frozen a moment before each pillar topples. Knowing the Abismos are held together by tension alone, one might assume —incorrectly— the new gravity-defying columns are too. 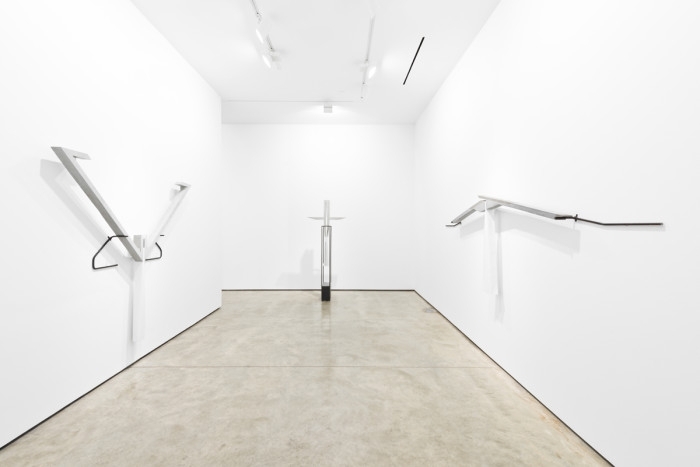 Instead, Simões has hidden a network of stabilizing rods inside these precarious-looking pieces, giving them an unexpected structural soundness at odds with their appearance. Before becoming an artist, Simões was an architect. He has long been interested in the promises, failures, and whiteness of modern architecture. Most major architects in the 20th century were white men. Many of the buildings they designed were white. That the six columns in this show are mostly paper (and white) would be less than ideal if they were actually load-bearing. 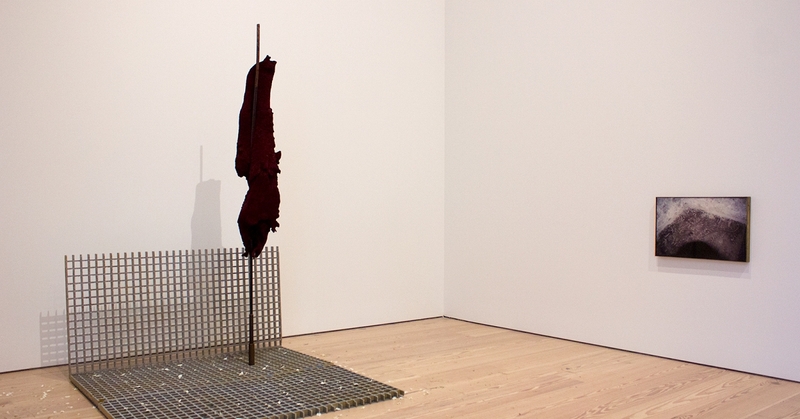 And yet —these sculptures thwart expectations. Sculptures and buildings both evolve in unexpected ways between their conception, design, construction, and use by their eventual owners. Their stories are more complex than a cursory glance reveals. Pruitt-Igoe, for example, was an urban housing project in St. Louis built in the 1950s. Its 33 high-rise buildings were designed to replace the city’s slums, which were dirty, unsafe, and crime-ridden. Early brochures promoting the project boasted of indoor plumbing, electric lights, and wide lawns on which children could safely play. But not long after opening its doors, things turned south: elevators broke, vandalism festered, piles of trash accumulated in the hallways. White people moved out, to the suburbs, leaving poor African-Americans behind. Drug dealing and prostitution became rampant. Pruitt-Igoe had come to resemble the slums it was meant to replace. 20 years after it was built, the governor of Missouri ordered it to be torn down. Many factors led to Pruitt-Igoe’s downfall. With so many moving parts —the architect, city, politicians, residents— no one could have predicted the project’s trajectory. When designing spaces, artworks, or even his own life, uncertainty is the most interesting component for Simões. 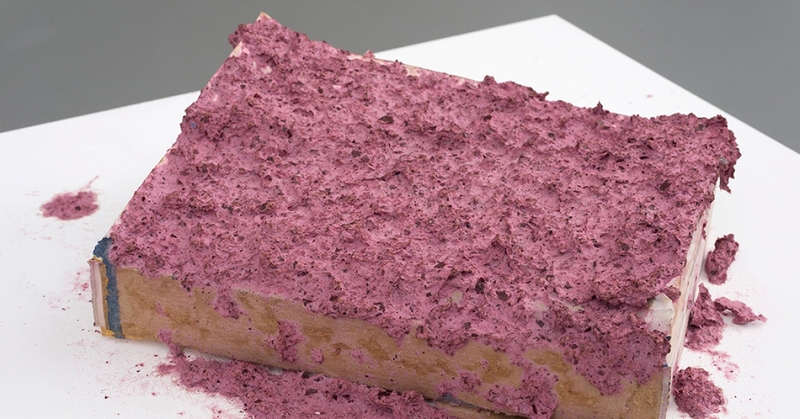 He makes precise renderings of his sculptures with architectural software before producing them. But perfection is not as easily achieved when casting concrete by hand or aligning hundreds of sheets of paper as it is when using a line tool in CAD. 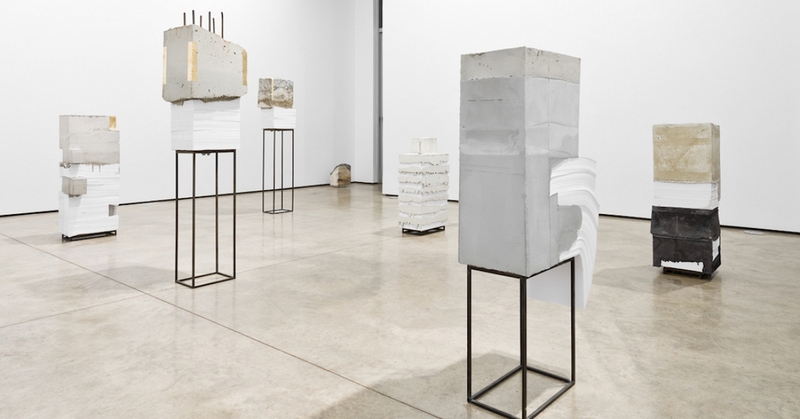 Given time, the concrete in Simões’s sculptures might develop micro-cracks and the paper might curl —analogous to Pruitt-Igoe changing over the years. What unites sculptures and buildings and people? All are alive and often unpredictable. Simões’s work is about buildings —their stability and failure, the promises their architects make and the consequences of their existence. The idiom in the title of the show, White Lies, implies a certain harmlessness. But thinking about the phrase in terms of race, instead, encourages a reconsideration of modern architecture, the people at its helm, and its effects on the world.